Upper Devonian: fig. 1, 4-7 - Famennian, borehole Zapadnaya Lekkeyaginskaya -65, sample 86g (depth 2460-2467 m); fig. 8, 9 - Middle Frasnian, Domanik Formation, the Ukhta River, sampling site no. 2, sample 1m. Karachaganak Massif: fig. 2 - Lower Permian, Artinskian, borehole 13, sample 3061 (depth 4995-5001 m); fig. 3 - Lower Carboniferous, Lower Serpukhovian, borehole 11, sample 360 (depth 4623-4638 m). Fig. 1. 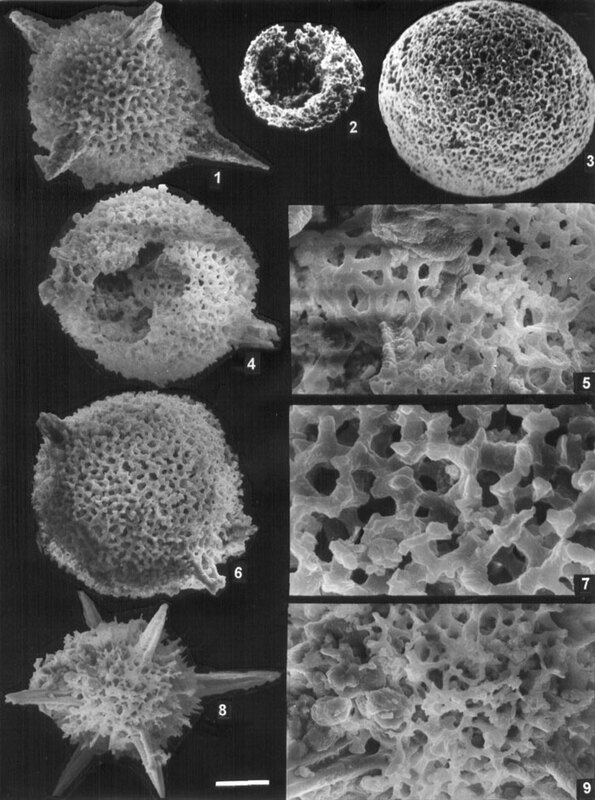 Spongentactinia crustescens (Foreman), FF-P001/088-12836 (bar=37µm). Fig. 2, 3. Spongentactinia fungosa Nazarov: 2 - FF-P229/228-00224 (=115µm); 3 - FF-P229/228-00211 (=46µm). Fig. 4-7. Spongentactinia diplostraca (Foreman): 4, 5 - FF-P001/084-13017, 4 - (=50µm), 5 - detail (=18µm); 6, 7 - FF-P001/084-12630, 6 - (=50µm), 7 - detail (=10µm). Fig. 8, 9. Meschedea crassicortex Won, FF-P001/121-13815: 8 - (=50µm), 9 - detail (=20µm).